The contribution of Australia and New Zealand to the global Placemaking movement, and to Project for Public Spaces’ learning and movement building, has been significant. The region has made many of the same discipline-led, and project-led, planning mistakes as the United States, but has often been quicker to admit it, and more importantly, quicker to learn, and develop new models. The city governments (councils) and professions have been less defined by their silos, and been innovative in synthesizing, and applying, new models of place-led design, governance, and economic development. Project for Public Spaces has been generously invited to collaborate with many inspiring partners to seed, inform, and drive the regional Placemaking movement in a broad range of contexts across the continent, making trips there about twice annually over the last decade. The transformation of Perth's Cultural Centre through Placemaking has been an inspiring model regionally and globally. 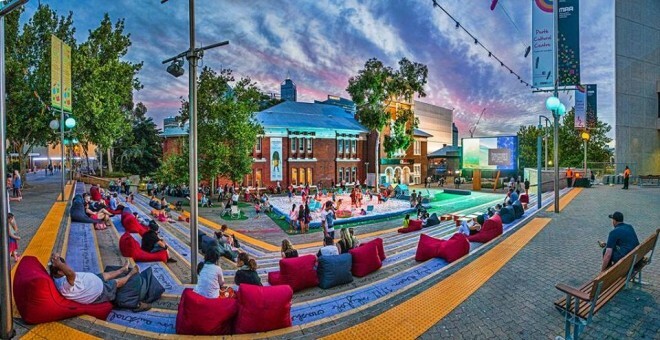 We have collaborated with many Australasian Placemaking organizations on building Placemaking capacity, movement building and applying Placemaking to high-profile projects. We have also led trainings and workshops with David Engwitch and his Creative Communities, Kylie Legge and her Place Partners, and collaborated with Lisa Montgomery at Perth’s MRA, before she founded Place Match. To organize the movement in New Zealand, we helped set up Placemaking New Zealand. In the Sydney region, PPS has partnered with Ed Blakely’s Future Cities Collaborative (FCC) on Placemaking trainings and workshops for their network of Placemaking leaders in New South Wales, and keynoting many of their public events. Site-specific workshops have ranged from rethinking the Cliff Walk and Bondi Beach, to inspiring a very “Lighter, Quicker, Cheaper” transformation of a park in Liverpool. With FCC we conducted city-wide capacity building trainings from Wollongong up to Gosford and Blacktown to Woollahra. FCC has also had us run separate Placemaking master-classes for Arts NSW, Transport NSW, and Urban Growth NSW, do lots of regional media, and collaborate on their dynamic US Study tours. Project for Public Spaces has participated in, and keynoted, many of the relevant regional conferences and speaker series, including, two International Society of Cities, Towns and Communities (ICTC) conferences [2007 and 2012], Parks and Leisure Australia, the Adelaide Velo City Conference, Queensland Planning's Shaping SE Queensland thought leaders series, a Public Markets conference, the Media Architecture Biennale and MPID Global Innovation Summit in Sydney, Auckland Conversations, and two Property Council of South Australia events. We helped conceive and organize, Places Victoria’s 2010 Melbourne Placemaking Series. We've collaborated closely with Place Leaders, the network of the largest cities and public development agencies, keynoting four of their conferences, and then a Place Leaders conference, as part of our global Future of Places series, gathering the Lord Mayors from the seven largest Australian cities, all declaring Placemaking as central to their work going forward. Place Leader's new magazine, IN PLACE, further demonstrates the Placemaking thought leadership from the region, and how it is connected globally. Working with many leading councils, PPS has customized trainings, often including strategic planning, and site specific work, for Melbourne, Bankstown, Wodonga, Sunshine Coast, Port of Melbourne, Parramatta, Canada Bay, Newcastle, Coburg, the Gold Coast and the Sydney Regional Commission. We have also conducted trainings for public development corporations and private developers including: General Property Trust, Places Victoria, Lend Lease, Perth’s MRA, and Renewal South Australia. We have led in-depth work to shape the direction of many of Australia’s most significant public spaces including Melbourne’s Federation Square and Victoria Market, Adelaide’s Festival Plaza, Parramatta’s Parramatta Square, Hamilton, NZ's Garden Place, and Waterfront Auckland. PPS continues to support, and learn from, these places, and their leadership on place-led development, place governance and placemaking. Our most successful project emerged from PPS being hired to shift Perth’s public development authority, MRA, from being very design-led to be place-led, with deep involvement in demonstration projects on the Perth Cultural Centre and Perth Link Square. The Cultural Centre, in particular demonstrated, how an underused public space could be rapidly transformed through “Lighter, Quicker, Cheaper” improvements. 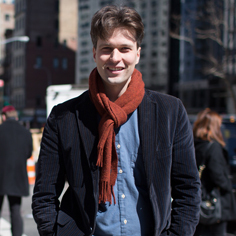 It has become a model for cultural districts to truly create culture. Adelaide has led Australia on working to institutionalize Placemaking into their governance. Over several trips, PPS has worked to build capacity for placemaking among all departments, and with precinct partners, and created a “Lighter _quicker, Cheaper program called Splash Adelaide. Under, Peter Smith’s leadership as CEO, Adelaide pioneered innovation around Place Governance developed metrics for measuring their success around “Place Capital”. Peter Smith after over 6 years as CEO, stepped down to help advance Place Governance and Placemaking regionally, and globally, and is working in close partnership with PPS towards these goals. Adelaide continues to make great progress around Placemaking under the leadership of Lord Mayor Martin Haese. Australia and New Zealand are at a ripe time to develop the leading models for Place Governance and place-led development that the rest of the world can learn from. 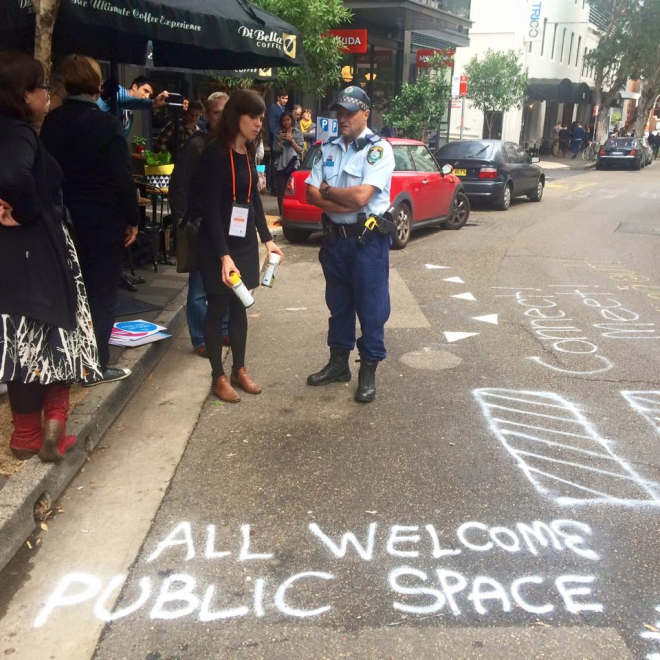 Australian Placemaker Lucinda Hartley was almost arrested for drawing chalk on the pavement in a completely sanctioned council chalking activity. Placemaking is strengthened by citizen-led activity but requires collaborative relationships and trust between councils, authorities and communities. Much of the leadership for Placemaking in Australia has come at the city level, and from professional Placemakers. These efforts need to be further networked and communicated to support each-other and to develop a stronger movement. There is great opportunity to get more grassroots support, as well as state and federal engagement, to sustain the movement, and lead it globally.